PASCO COUNTY, Fla., Nov. 2, 2018 /Christian Newswire/ -- Pasco County Public School personnel have adopted a harmful, unauthorized "policy" and practice of promoting LGBT ideology in violation of the rights of students, parents, and teachers, without school board approval. Jackie Jackson-Dean, a school psychologist, credits herself as lead author of the "Gender Support Plan" and "Best Practices Guide" adopted without school board approval. She has been working on it since at least 2017. As noted by OutCoast, hiring Jackson-Dean as LGBTQ liaison was a "radical move for Pasco County." METRO's LGBTQ coordinator, Cole Foust, and Jackson-Dean "came together to figure out how to get all of the high school Gay-Straight Alliance (GSA) youth together from across the county for a more interactive event... The GSA Mixer is funded through METRO's annual budget and METRO's SAFE Youth Groups welcome youth ages 13-18 and …youth ages 13-22." 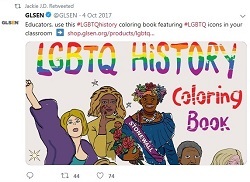 Jackson-Dean has urged other educators to use an "LGBTQ History Coloring Book" featuring men dressed in drag and other homosexual characters. Jackson-Dean supports introducing LGBT issues through "windows" when "doors seem to be closed." Jackson-Dean supports lesson plans glorifying pederast Harvey Milk. Jackson-Dean wants to "swiftly and directly" punish students and teachers who refuse to use false gender pronouns. Jackson-Dean supports "accountability" and "powerful reinforcement" so students identifying as LGBT stay LGBT. Jackson-Dean believes "educators should not face push-back" for classroom LGBT activism. "The Pasco County School Board must take immediate action to protect its students, teachers, and parents and no longer allow certain school employees and administrators to freely violate parental and employee rights and the privacy rights of students," said Mat Staver, Founder and Chairman of Liberty Counsel. "Parents expect to send their children to school to learn academics, not LGBT indoctrination. The Pasco County Schools must bring its employees into compliance with the law and cease putting students and teachers into harmful situations," said Staver.